The vast majority of the source material quoted in the footnotes to Section 1 of the book has been copied on to a DVD. It is divided into 7 headings and is limited to the Kopul era. A detailed index to these archives is to be found below. Extracts of letters written home from Carmel College by the pupil Anthony Rau between the years 1950 and 1955. About 50 Old Carmelis from the Kopul era have written down their recollections. They are of varying length, and in a few cases they are part of the autobiographies of these Old Carmelis. They appear in alphabetical order. 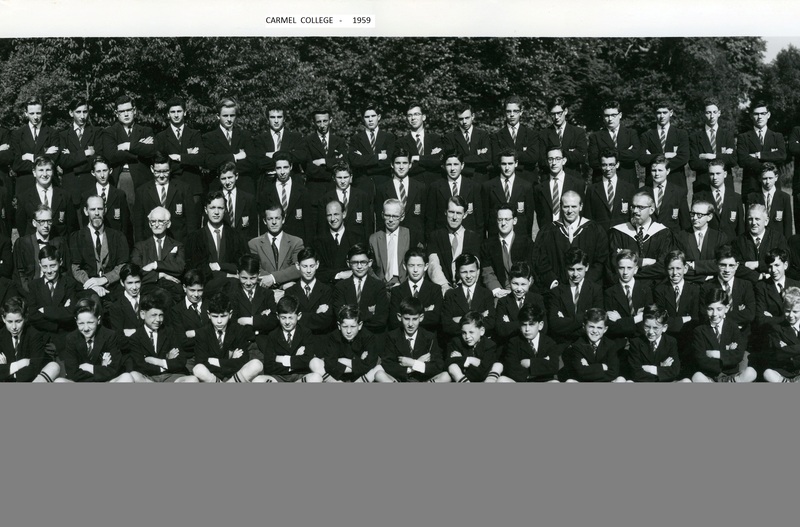 In 1988, the Old Carmeli Association brought out a book in which members of staff and alumni of Carmel wrote their recollections of the school, many of them appertaining to the Kopul era. In 1970, a book entitled “Memories of Kopul Rosen” was published, parts of which deal directly with Carmel College. A selection of documents illustrating the history of these three locations, and especially of the Carmel estates at these locations. NOTE: The originals of many of the documents in these archives were pale, with some being almost illegible. This was the result of age, the use of worn carbon paper or inadequate ink being used in the duplicating or printing process. Also, some of the newspapers had yellowed over the period of time. Using a computer program, an attempt was made to make the words on these documents darker, which sometimes resulted in the background taking on a yellow-brown tinge. Should the words on any documents still be difficult to read, it is suggested that one enlarges the words on the screen of the computer. Correspondence of Kopul Rosen (almost 200 letters) between June 1947 and May 1948, namely prior to the opening of the school. Almost all of it deals with the subject of loans in order to purchase the Greenham Estate and for the initial running costs of Carmel College. A handful of letters dated January 1949 on the same subject. Incorporation document and certificate of Incorporation of Carmel College Limited. Memorandum of Association of Carmel College Limited. Articles of Association of Carmel College Limited. Annual Accounts for the period between 11 December 1947 and 31 August 1962 of Carmel College Limited submitted to the Companies Registration Office. Annual Returns for the years 1949 to 1962 of Carmel College Limited submitted to the Companies Registration Office. These returns list the names and particulars of the Governors and the Secretaries. Notifications between 1948 and1961 to Companies Registration Office of Changes in Governors, Secretaries, Registered Offices etc. Draft Minutes of first meeting of Carmel College Limited held on 17 December 1947. The minutes of 2 meetings. (These are the only ones which have been traced). The minutes of 4 meetings. (These are the only ones which have been traced). Two letters sent to parents by Governors and one sent to parents by Kopul Rosen. Review of the year 1955-56 by the Chairman of the Governors. 01: Circular giving details of the Life Associate Scheme � about 1953. Taking over theatres for �My Fair Lady,� �The Diary of Anne Frank� (including sample pages of a brochure) and the menu of a dinner at the Dorchester Hotel. Detailed programmes for Exhibition Days held in 1957 and 1958. Two letters sent to parents announcing the increase in school fees. Statement on the awarding of scholarships and bursaries. Two sample covenants in favour of Carmel College. Miscellaneous material including some letters and a list of Governors. Contract for sale and purchase of the Freehold Mansion House and premises known as Mongewell Park dated 26 January 1953. Deed of Conveyance of Mongewell estate (written in copperplate writing) dated 7 August 1953. Two lists of fees paid for each pupil (names have been deleted). List of parents with the possibilities of them taking out a covenant to pay school fees (names have been deleted). Sample school fees bills and receipts which were sent to parents. (names have been deleted). A number of miscellaneous invoices and orders. An 8 page prospectus with 3 photographs brought out in about April 1948, namely before the school opened. An 18 page prospectus, 7 of the pages being photographs, brought out in 1951. A 20 page prospectus, 11 of the pages being photographs, brought out in about 1959. A 30 page booklet with numerous photographs brought out to mark the 10th anniversary of the founding of Carmel College. A booklet brought out in memory of Kopul Rosen. Invitation to meet Viscount Samuel on his visit to Carmel College in May 1951. Invitation and programme for the opening of Carmel Mongewell campus in December 1953. Programme for official opening of Wolfson dormitory in November 1958. Speech Day invitations for 1954, 1955, and programmes for 1955 and 1960. 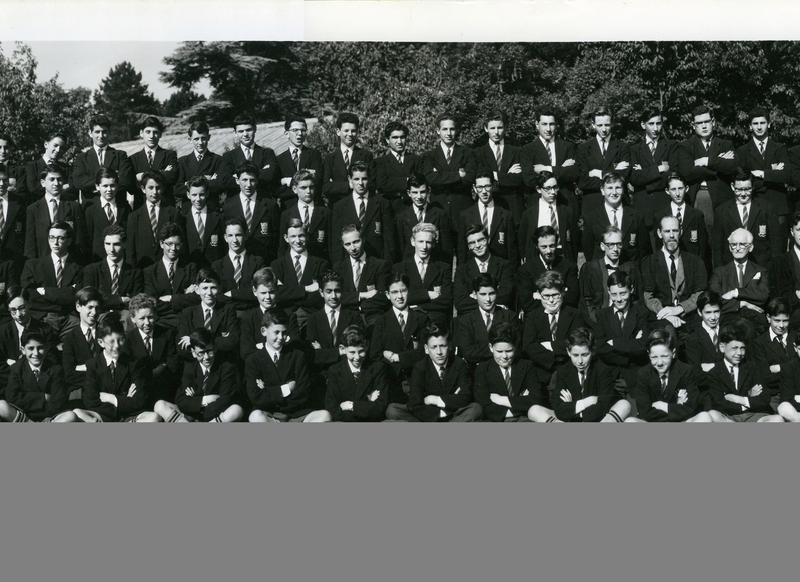 Three lists of all the Senior School pupils with their forms, one of them is for the summer term 1957 and two for the autumn term 1957. A booklet with the staff list, lists of pupils in Senior School and diary for all the days in the academic year 1958/59. 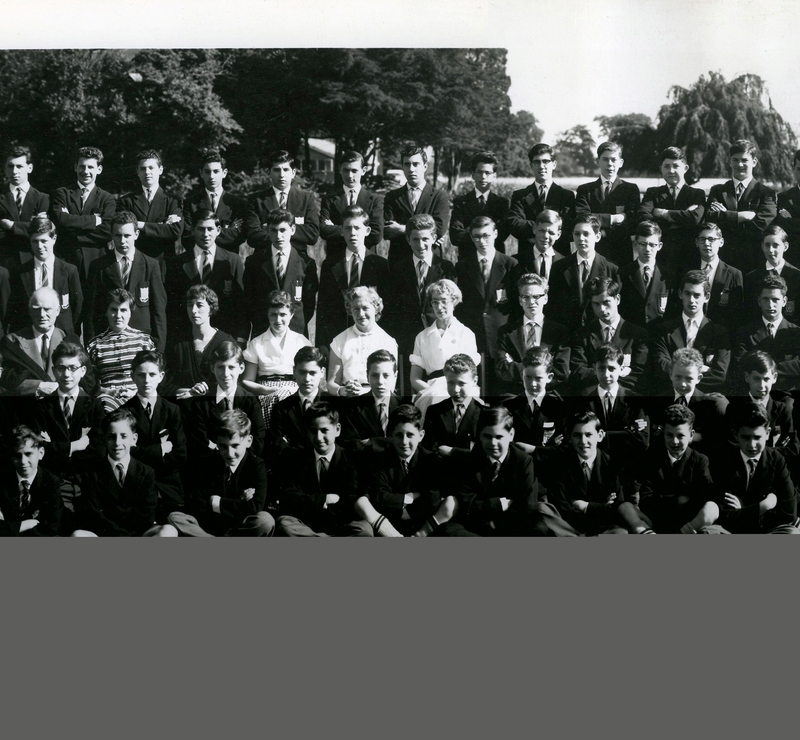 List of all the Senior School pupils with their forms for the summer term 1958. During the Kopul era, there were various	formats of school reports for the pupils of both the Preparatory School and the Senior School. Sample Preparatory School reports during the Kopul era. (names have been deleted). Sample Senior School reports during the Kopul era. (names have been deleted). Sample pages of pupils� successes in both O-level and A-level examinations sent out by the Carmel College office during the summer vacation. Every summer from 1954 the official Carmel College magazine entitled �Carmel� was published. vol.1 no.1. 49 pages of printed matter and drawings. vol.1 no.2. 57 pages of printed matter, photographs and drawings. vol.1 no.3. 45 pages of printed matter, photographs and drawings. vol.1 no.4. 47 pages of printed matter and photographs. vol.1 no.5. 48 pages of printed matter, photographs and an architect�s drawing for Carmel College of the future. vol.1 no.6. 57 pages of printed matter, photographs and drawings. vol.1 no.7. 53 pages of printed matter, photographs and some thumb-nail sketches. vol.1 no.8. 51 pages of printed matter, photographs and some thumb-nail sketches. vol.1 no.9. 51 pages of printed matter and photographs and a tribute to Kopul Rosen who had died during that academic year. A magazine with 20 duplicated pages which came out in July 1953 and had just one issue. A magazine for the Junior part of the Senior School which came out in March 1954 and had just one issue. Of the 43 pages, there are a number containing advertisements. A 6 page duplicated magazine which came out just once in May 1956. A duplicated undated (about 1957) magazine with 19 pages which only had one issue. A duplicated magazine with advertisements; the cover and some of the advertisements are in colour. A number of issues came out. vol.1 no.1. 21 pages. It came out towards the end of 1957.
vol.1. no.2 19 pages and is entitled �Purim edition,� spring term 1958.
vol.1 no.3. 24 pages. It came out in December 1958. 24 pages. It came out in the autumn of 1961. The Junior Biology Society brought out its own magazine with 11 pages in January 1958. The Preparatory School brought out its own magazines. vol.1 no.1. 20 pages of printed matter with no photographs or drawings. It came out in July 1954.
vol.1. no.2. 20 pages of printed matter with one photograph. It came out in July 1955.
vol.1 no.3. 19 pages of printed matter which includes several photographs. It came out in July 1956 and is labeled �Tercentenary Number� (1956 marked 300 years since the Jews had been readmitted to Britain). 20 printed pages and a photograph of the Main Building on its cover. It came out in July 1958. 20 printed pages and a photograph of the lake in the Carmel grounds on its cover. It came out in July 1959. Miscellaneous correspondence in connection with Carmel magazines. The only Carmel society whose records have been traced is the Science Society between the years 1950 and1955. The records are almost entirely correspondence between the Science Society and numerous organisations asking that the members of the society be able to visit the organisations. Programmes of 3 concerts held at Carmel College whilst it was at Greenham. Sheet on composers of modern music written by Malcolm Shifrin for his �Musica Viva� Group, dated November 1958. Hebrew song sheets; on some of them the Hebrew words have also been transliterated into English letters. Programmes of several dramatic activities put on by the Carmel Dramatic Society, and of a Purim Revue on Purim 1960. A programme and invitations to House Parties. Programme for a variety show put on by some pupils in 1958. Very detailed handwritten accounts of the Football matches played by Carmel College against outside teams. A card issued by the Carmel College Cricket Club giving all the fixtures for the 1958 season. Every year on Sports Day a duplicated programme was distributed giving the results of events already decided and of the events to take place on the actual Sports Day. An invitation to a Sports Day, and a circular regarding a postponed Sports Day. Swimming certificate awarded by the Preparatory School. Several memoranda written by the librarian Malcolm Shifrin. A 9 page duplicated guide on how to use the Carmel Library. A 21 page printed guide on how to use the Carmel Library. Two sample completed suggestion slips for purchase of books for the Carmel Library. A 3 page memorandum on the situation of the Carmel archives �Carmelismus� in the late 1950s. Three different Clothes Lists issued in: 1948, about 1950 and late 1950s, and a Health Certificate. The first edition of the Zemirot book �Beshir vekol Todah� brought out in October 1955 by Dr. Alexander Tobias for use at the Shabbat meals at Carmel. A 20 page Report by H.M Inspectors following a full inspection of Carmel College made in 1955. A 9 page undated (about 1960) printed copy of �An Appraisal of Carmel College� written by Kopul Rosen. A 6 page typewritten memorandum by Kopul Rosen on his plans to set up a Carmel College in Israel. The list of Hebrew names of teachers and pupils who were at Carmel when it opened in 1948 for use of the Shul gabbais when they called up a person for the Reading of the Torah. A suggested list of books that the pupils should read which was brought out in the early days of Carmel College. Two circulars sent out to parents, and two letters written to individual Old Boys by Kopul Rosen in the months before he died. Letter written by Abraham Carmel to Malcolm Shifrin in July 1957. The daily timetable of the Senior School brought out in October 1957. Draft Constitution of OCA together with handwritten amendments (last page missing), and Constitution from 1953. Various letters in connection with the OCA. Periodic Bulletins brought out by OCA between 1954 and 1957 (number 1 is missing). Sample OCA notepaper, and an invitation. Inside and outside Greenham Lodge and the surrounding Estate. Consecration of Synagogue by Chief Rabbi Israel Brodie in 1950. Scenes during the Annual Speech Day. The laboratories and science lessons. 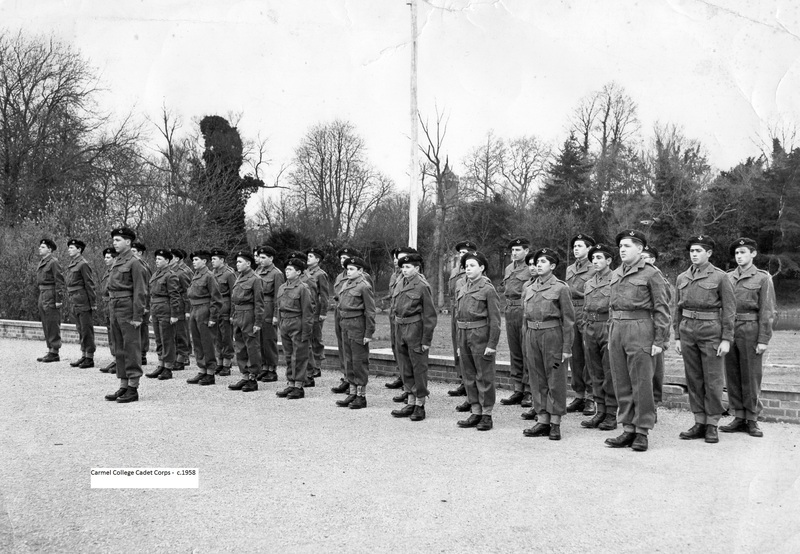 A staff photograph and individual members of staff. Groups of pupils in some cases together with a teacher. Various groups which include parents, teachers, and pupils. Includes photographs of the Estate in 1939. Different areas of the Estate including the outside of the Main Building, the dining hall, the swimming pool, and the boathouse. There is also a very old photograph of the Main Building with a dome over the area of the main hall. Pupils working in the various science laboratories, in some cases with the teachers. Different lessons in progress, some in the classrooms whilst others outside, and also the choir rehearsing. Pupils looking for books, reading and working in the library. The lighting of Chanukah candles in the Main Hall. 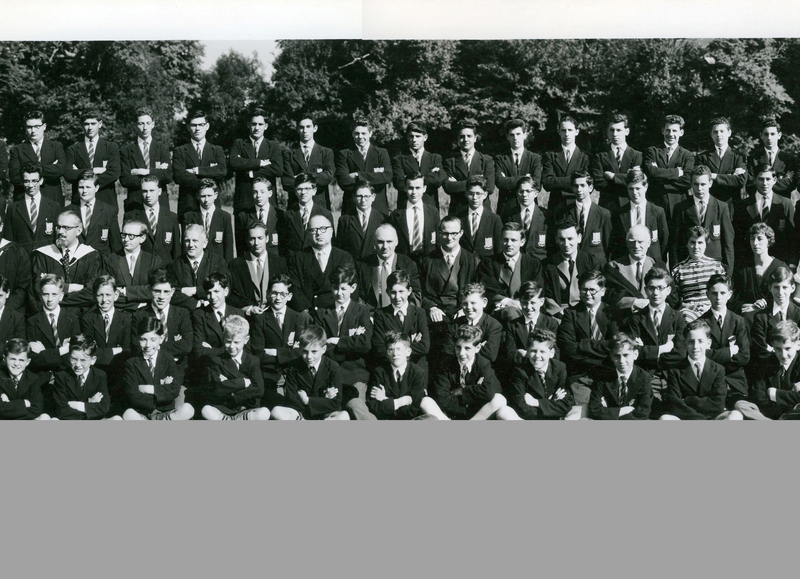 A group picture and individual members of staff, and the elderly groundsman Ted Wetherall. Various groups of pupils, and Miss Arons serving in the tuck shop. The ceremony and the donors touring the sanatorium. Includes rugger, cricket, athletics, tug-of-war, squash, tennis, gymnasium scenes, rowing and chess. Includes pupils involved in various activities, and scenes in the kitchen. 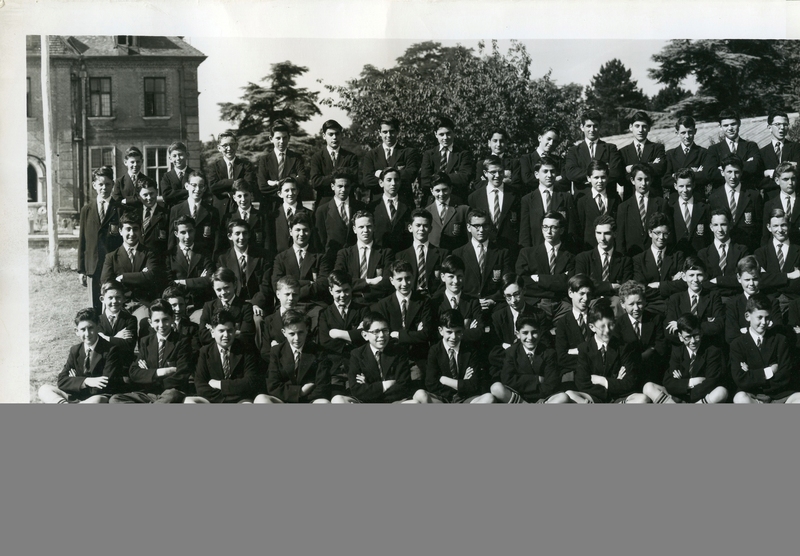 Every other year from 1953 onwards a photograph was taken of the entire school. A large number of photographs are also to be found under different sections of these archives. Selection of advertisements for teachers in the Jewish and national press. Advertisements in the �Jewish Chronicle� announcing scholarship examinations. News cuttings concerning the Governors of Carmel College. Advertisements for a bursar and news cuttings on the bursar Captain Lunzer. News cuttings on the annual Speech Days, consecration of Greenham Synagogue, and visitations of prominent Anglo-Jews. News cuttings on cricket, chess and rowing. Report on the annual visit of the Jewish Chronicle staff and families to Carmel with particular reference to the cricket match played during that visit. News cuttings on the formation and activities of the OCA. News cuttings on a variety of matters connected with Carmel College. An 8 page supplement of the �Jewish Chronicle� on Carmel College dated November 1958. A 3 page article plus cover page on Carmel College which appeared in the �Jewish Observer and Middle East Review� in February 1962. 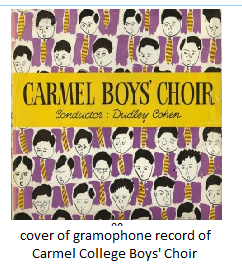 Recordings of 10 songs sung by the Carmel Boys� Choir, conductor Dudley Cohen, in about 1958. A recording of the entire ceremony (with the exception of the distribution of the prizes). 01 Speech delivered by Kopul Rosen at the opening ceremony of the Wix Sanatorium at Carmel College in the summer of 1960. 02 Speech recorded by Kopul Rosen for a fund raising dinner in aid of buildings at Carmel College, towards the end of 1961. Due to Kopul�s state of health he could not be present in person, but sent a recording of his speech. 03 Recording made by Kopul Rosen for the Old Boys. It was made just a couple of months before died. 01: Colour cine clip from Sports Day 1955. Includes �little� David Rosen competing against the �big� Senior Boys! 02: Colour cine clip from Sports Day 1956. 03: Colour cine clip from Sports Day 1959. 04: Colour cine clip from Sports Day 1961. 01: Colour cine clip of a cricket match played in 1955. About 1958, a black and white film of Carmel College was produced. Although this film has not been traced, clips from it were used in a film made in the 1960s. 01: Kopul Rosen watching a Carmel football match. 02: Kopul Rosen in the dining hall. 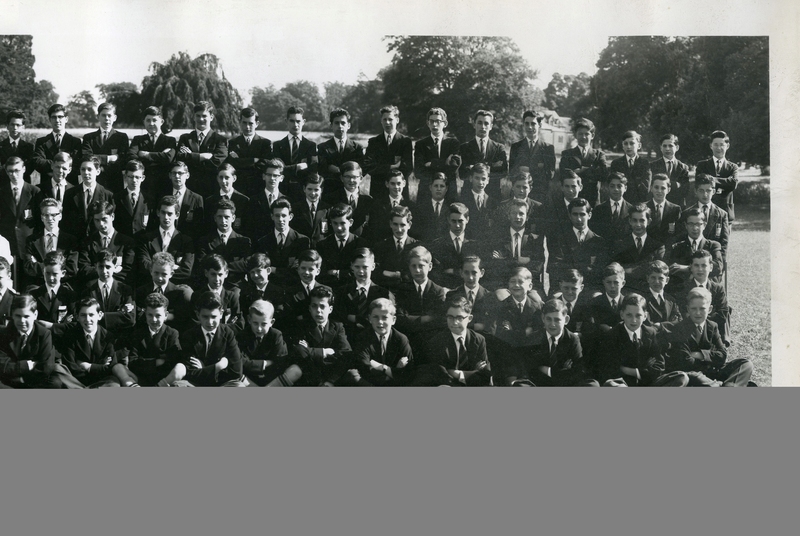 The detailed recollections of a Old Carmeli, who was a pupil at the school between 1953 and 1960.